The independent TD is “completely fed up” with Mick Wallace’s actions and doesn’t want him inside the technical group. Finian McGrath is thought to have quit over the fact that Mick Wallace cannot be stopped from rejoining the Dáil's technical group. 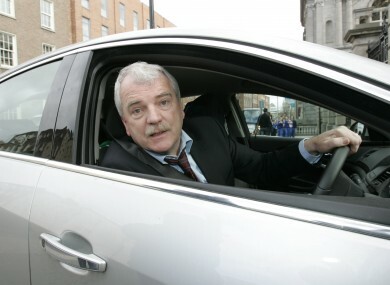 INDEPENDENT TD FINIAN MCGRATH has quit as the chairman of the Dáil’s technical group of independent and small party TDs – citing the actions of independent TD Mick Wallace, who has been permitted to rejoin the group. McGrath had been vocally opposed to Wallace’s membership of the group since details of his company’s deliberate under-declaration of VAT had become public – and says he is “completely fed-up” with Wallace’s subsequent actions”. In a statement this afternoon McGrath said he was “appalled” at Dáil rules, which mean that a member cannot be barred from a technical group, which is not in itself a political party. McGrath said those Dáil rules “force a group of Independent TDs to have a member that the vast majority don’t want”. Wallace had resigned from the group shortly after his company’s VAT under-declaration became known – but had expressed an interest recently in once again being included in the group in order to obtain speaking time on Dáil motions. A spokeswoman for the group’s whip, Catherine Murphy, said Wallace had now asked to be associated with the group so that he could participate fully in Dáil proceedings. McGrath also said he thought it “outrageous” that a TD could make comments like those Wallace had made the weekend before last, when he recounted a story of threatening to hire a hitman to recover a loan that was due to him. “This remark is outrageous for a member of the Oireachtas particularly in the current crime crisis,” McGrath said. McGrath has written to the Ceann Comhairle, Seán Barrett, asking for a formal response on whether Wallace can be rejected from the group by its other members. He said he would make his final decision on whether to remain inside the group once that response was received. The resignation follows Clare Daly’s departure from the Socialist Party in a dispute about the political support that Daly had offered the Wexford TD and former developer. She remains a member of both the technical group and the United Left Alliance, however. Email “McGrath quits as chairman of Dáil’s technical group in Wallace row”. Feedback on “McGrath quits as chairman of Dáil’s technical group in Wallace row”.